Here you will find great tips and ideas for cocktail party invitations. Your cocktail party invitations are a very important introduction to your party and the first “taste” your guests gets of the party. So, this is the perfect opportunity to set the scene for what they can expect. Ø	The guest and partner’s names. For formal parties (like weddings) and corporate events, you should include the titles of the guests as well. Generally, a married couple with be invited under the husband’s name, for example “Mr and Mrs Rich Vos”. This is not necessarily so for unmarried couples. If you are in doubt, best find out from the guests themselves. Ø	The occasion or reason for the party, for example whose birthday or wedding it is. This is not necessary if there is no particular event attached to the party, but you can mention “Just for fun” or “For old time’s sake” or whatever. Ø	Date and time and also the end date if any. People tend to arrive 30 to 60 minutes after the time stated on the invitation so if you would like the party to start at 19:00, state the start time as 18:00 or 18:30. You can also use the format “18:00 for 18:30” which means you want your guests to start arriving from 18:00 and make sure they are there at 18:30. If you want the party to end at a certain time, state this clearly, for example “18:00 to 21:30”. Allow for at least a 30 minute margin here as well. Ø	Dress code or theme of the party, if any. The theme should dictate the design on the invitation. You want your guests to experience the theme right from the start. For example, in the case of a Black Tie Cocktail Party, put a picture of a black tie on the invitation. Ø	The venue, with directions and/or a road map. Ø	The RSVP date with the contact details (name, number, e-mail) of the person they need to respond to. How far before the actual date of the party is after the RSVP date depends on the occasion. For big events where a lot of things like catering and entertainment need to be organized, it is usual (and crucial!) for people to RSVP at least 2 to 4 weeks in advance. For smaller, less formal events a week should be fine. Ø	Your name or the name of the host (if not you). Ø	Other essential information. For example, if guest are likely to bring gifts (for a wedding say), what type gifts are preferred (cash, home ware, etc.). You should send your invitations 3 weeks before the party and sooner if you can, but definitely not later than 2 weeks before. For more formal events, like weddings, and for events people need to arrange for traveling and accommodation, you can even send it 3 months and not later than 2 months in advance. You have to decide if you are going to go for paper invitations and post them, or electronic invitations and e-mail them. For the more creative folk among us, this is a fantastic opportunity to show off your talents. Go to a stationary store, or store specializing in different kinds of paper and buy some nice coloured and textured paper and envelopes. You can either write on it by hand, or type the text on a computer and put the blank invitation cards through the printer. Alternatively you can have it printed at a print shop or online. Print shops (off and online - click here for an example) usually offer hundreds of designs you can choose from and can be purchased in packs. Expect to pay anything from $2 to $10 each for a set of 10. The price obviously depends greatly on the quality of the design and the number of invitations you order. Electronic cocktail party invitations are very common these days. It can take the form of a simple text mobile phone message, a multi media mobile message, a text e-mail, an electronic invitation (like MS Outlook calender invitations) or electronic card that gets e-mailed. Here is an example of an invitation that was created with MS Word in less than 10 minutes. 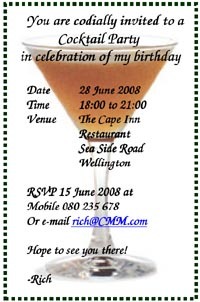 Here's to create a cocktail party invitation like this one: Open MS Word and open a new document (File > New). Click Insert > Text Box. A text box will apprear. Shape the box to the size and shape you want it. If you want to insert a picture or clip art, click Insert > Picture and select the appropriate item. Right-click on the picture to format it and resize it if necessary. Click on the text box again and insert the text. Highlight the text and click Format > Font to format is. It is advisable to use different font sizes and even fonts to make the invitation exciting. Right-click on the text box to format it, for example to put a frame around. You can also us MS PowerPoint for this. There are numerous websites that let you design custom-made invitations based on a range of templates you can choose from and e-mails them to your guests. You of course need all your guest’s e-mail addresses for this. Whatever format you choose for your cocktail party invitations, it is advisable to stick to one (paper, e-mail, etc.) as multiple formats can become too much to handle. You can combine a paper invitation with a follow-up e-mail or mobile text message to check if your guests did receive it.